Israel Defence Forces bombarded scores of Hamas targets earlier this week after a surprise long-range rocket from Gaza injured seven people near Tel Aviv on Monday. 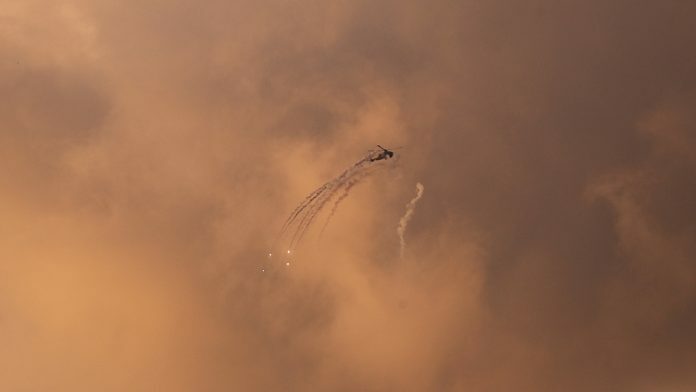 Israeli aircraft hit targets overnight into Tuesday while Gaza militants fired over 100 missiles into southern Israel as tensions on the Gaza Strip once again increased. Among targets reportedly hit was Hamas’ military intelligence headquarters, the office of Hamas leader Ismail Haniyeh, Khan Younis port and an underground facility near the security fence. An Egyptian-mediated ceasefire was disputed by Israeli officials but an unofficial cease-fire held overnight into Wednesday aside from spasmodic exchanges of fire. There were no reports of casualties as both Israel and Hamas appeared set to step back from a full-fledged confrontation with Israeli elections less than two weeks away. However, a tense situation remains with Israel ready to strike hard. The IDF have strengthened forces along the Gaza border if required and there is speculation violence might erupt when Hamas marks the first anniversary of March of Return riots with reportedly large protests. Israeli communities near the border and in southern cities reopened schools following advice from the Home Front Command on Wednesday after being closed during the three-day hostilities. The spark for violence came after a missile fired from Gaza destroyed the home of a British-Israeli family at Moshav Mishmeret in central Israel in the early hours of Monday. Robert and Susan Wolf made Aliyah 30 years ago, Susan was among those treated by Magen David Adom and transported to Meir Hospital in Kfar Sava. Prime Minister Benjamin Netanyahu was in Washington at the time witnessing US President Donald Trump sign a declaration at the White House recognising Israel’s sovereignty over the Golan Heights. Following the ceremony, Netanyahu cut short his trip and to return swiftly to Israel. Speaking from the White House prior to his departure, he said Israel would protect its citizens. President Trump said the United States recognised Israel’s “absolute right” to defend itself. On his return to Israel on Tuesday morning, Netanyahu held meetings at the Defense Ministry headquarters in Tel Aviv and made it clear that Israel was “prepared to do a lot more”. Addressing the annual AIPAC conference in Washington, the US’s biggest pro-Israel lobby via satellite, Netanyahu, who was been due to speak, reiterated his earlier message that Israel would do whatever is necessary to defend its people and defend the State. US Vice President Mike Pence said the rocket attack proved Hamas was not a partner for peace. “Hamas is a terrorist organisation that seeks the destruction of Israel, and the United States will never negotiate with terrorist Hamas,” he noted. And United Nations Middle East envoy Nikolay Mladenov condemned the rocket fire as “absolutely unacceptable”. Public Security Minister Gilad Erdan told Israeli Army Radio rumours of a ceasefire were incorrect. “We are just at the beginning,” said IDF spokesman Brig. Gen. Ronen Manelis as the response began. Israel’s military confirmed the locally made rocket had a range of 75 miles. The IDF mobilised two armour and infantry brigades on the Gaza border and called up reservists and intelligence units in preparation to respond forcefully. Troops were also deployed in southern Israel. IDF Spokesman Ronen Manelis told reporters at a press briefing the rocket was fired from the Rafah area of southern Gaza. Questioned why the rocket was not intercepted by Israel’s Iron Dome defense system, Manelis said it protected areas where it was stationed according to operational situation assessments. He added, “The IDF is improving its readiness for a variety of scenarios. Jewish leaders around the world condemned the attack. World Jewish Congress President Ronald Lauder described the assault as “absolutely intolerable”. He added, “Our thoughts are with the victims of this attack, who miraculously survived despite a direct hit on their home. It is inconceivable residents and citizens of Israel should have to live in fear for their lives and property. “Hamas is a terrorist organisation that exploits the lives of innocent civilians in its boundless quest to terrify Israelis and destroy the State of Israel. It is high time that the international community recognise Hamas for what it is and condemn it in the strongest terms possible. Board of Deputies President Marie van der Zyl reacted with horror to the rocket attack. “Our commitment to the State of Israel’s right to defend its borders and civilians is resolute,” she said. Politically, Hamas are under increasing pressure in Gaza with an unemployment rate over 50 percent. The terror group has held weekly protests on the Israeli border for 12 months in efforts to ease the blockade, but 190 people have been killed by Israeli retaliation to rocket fire. Only last week, hundreds of Gazans protested, a rare occurrence, Hamas arrested dozens of demonstrators resulting in public criticism.